What is up with Asian carp? Presentations at the February Asian Carp Coordinating Council Technical and Policy Workgroup meeting revealed that studies and monitoring prove that Asian carp are still far downstream from the Chicago River System. 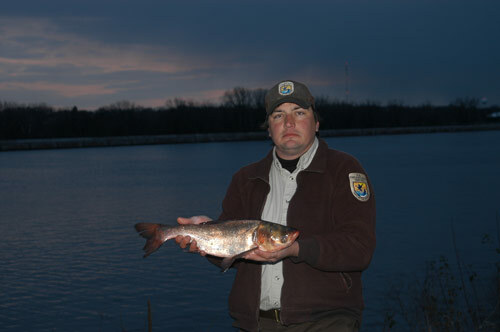 While no one expressed a diminished need to contain the carp which are still a major threat, staff from USEPA, US Army Corps of Engineers, Illinois Department of Natural Resources and other agencies present all stated unequivocally that they do not believe that there are any bighead or silver (Asian) carp near Chicago at all. USEPA’s Bill Bolen opened his remarks with “we should take the battle downstream where the fish are.” That is, downstream of Marseilles, Ill., near Ottawa. Among the presentations was one about efficacy studies of environmentalDNA (eDNA), which confirm, in tandem with extensive monitoring, that that positive hits for eDNA found in the Chicago River System were due to vectors like birds, boats, fishing gear and sediments. These studies’ results allow everyone to focus on long-term comprehensive solutions rather that short-term solutions that may harm the Chicago River. Will the Chicago River Reverse?